Like everyone else on the Edinburgh art/indie/boheme scene, Nana is disturbed at the possibility that such a venerably crazy institution as The Forest Cafe might close. Nana has fond memories of much craziness at said venue; of witnessing her own little acorn’s first forays into public creativity, and of giggling with renowned international academics made easy by the unique Forest atmosphere. Here’s a way to help support. Please pass this on to as many people as you can. The Forest Café in Edinburgh is an arts and community project space with an art gallery, café, performance space, recording studio, rehearsal room, darkroom, screen printing studio and publishing facilities. Powered by the enthusiasm and dedication of hardworking, generous and committed volunteers, it has been a vivid, vibrant part of Edinburgh’s creative scene for over a decade. EUS (Edinburgh University Settlement), the previous landlord of the venue was recently declared bankrupt (leading to the closure of the Roxy Art House), and Forest doesn’t want to go the same way. And so to the Filmhouse for a lecture entitled ‘Shining the spotlight on Scotland’s creative cities’ to give Andrew Dixon, the new head of Creative Scotland, the once-over. ‘What news?’ I hear you cry. Well, blogistas. To Nana’s delight she discovered she shares many roots with the seemingly amiable Mr. Dixon. Not only does he also hail from the rural nort west of England, Nana was a resident of Gateshead at the time Mr. Dixon was canvassing local support for Gormley’s Angel of the North. Of course ﻿Nana was counted amongst the 20% of the local population who supported the project at that time (hopefully the Saltwell has kept those comment books). And now here we both are, in Scotland. And what of Mr. Dixon’s creative vision for this nation? 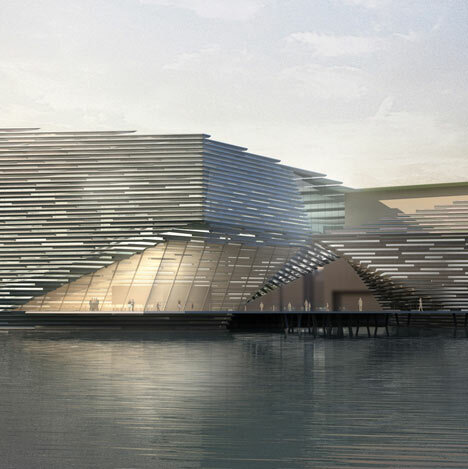 Honourable mentions went to Edinburgh (The Fruitmarket), Glasgow (School of Modern Art) and Dundee (Dundee Contemporary Arts and the glorious, ﻿proposed V and A, seen here below). But Mr. Dixon also had time for the wee places, with Ullapool and the Shetlands firmly on his radar. There was much talk of festivals and of the need to logistically rationalise and capitalise on the many festivals currently held in Scotland. Mr. Dixon seemed to favour a literary focus (Edinburgh) and a musical vibe (announcing that Glasgow had just been shortlisted to host the World Music Expo). Whilst he stressed the importance of the individual artist (glowing with pride and enthusiasm for his new Creative Futures stream, which aims to have supported over 1,000 artists in the next 5 years), he also talked about access (he has previously worked for Artlink), particularly stressing the needs of the increasingly elderly population. So, fellow artists, you know what to do…..
Oh, and don’t forget to look out for the launch of Creative Scotland’s 10 year vision early in 2011. Filmakers take note, however, when drawn on this subject by an eager questioner, Mr. Dixon’s only comment was ‘Scotland’s a great film location’………….